How many interviews to do? Usually, 5 - 7 are enough to spot trends. If you did 7 and they all different - odds are you're doing something wrong during the research. Comments are often more important than scores. Getting satisfaction scores are mattering but much more valuable is to get comments from your customers or/and observe them going through your product journey. Your journey steps should be big enough. Asking your customers to rate their satisfaction from every button or a line of text is a waste of time for all parties. 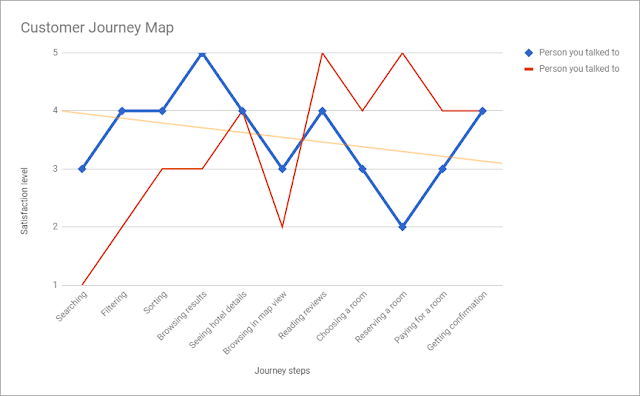 Your journey steps should be of a meaningful size and could be rated independently. Do you want to delight your customers? Improving customer experiences is the core responsibility of any PM. To delight your customers, use Customer Journey Map. Measure the current satisfaction. Improve your product. Redo the study and see more delighted customers.